For several months, access and property rights advocates have been investigating the facts in an incident involving misuse of official government seals by the California Wilderness Coalition (CWC) and The Nature Conservancy (TNC). In a letter to California Governor Gray Davis, following a Missing Linkages symposium hosted by the California Wilderness Coalition (CWC) in November 2000, participants submitted a letter to Governor Davis summarizing the results of the conference and urging him to take action to set aside lands for wilderness. The letter contains the official logo of the United States Geological Survey (USGS) along with names of federal employees, their official affiliations (USGS, USFS, and BLM) and the California State Parks seal with State Parks employee affiliations. This use of the official seal of the USGS and federal affiliations is unlawful. Access and property rights advocates in the California contacted the USGS about the CWC and TNC misusing USGS seal to promote The Wildlands Project. A transcript of the letter received from USGS is included below. Within that letter, Mr. Charles G. Groat, Director of USGS, stated the seal was used without authorization. In detail, Mr. Groat explains how the junior, noncareer employees signed a blank piece of paper at the request of the CWC representative using personal email accounts to complete the transactions. Mr. Groat stated that the USGS employees were acting as "private citizens". The 79 page symposium report includes a statement that USGS and California State Parks were "cosponsors" and Appendix E of the report is a list of the conference participants. In the appendix to the symposium report, all of the attendees are listed by affiliation including their OFFICIAL government phone numbers and government email addresses. Documentation about the symposium lists the USGS and California State Parks as cosponsers. A press release by the CWC and TNC about the symposium was placed in the San Francisco Chronicle on August 7, 2001 and included the statement: "The report was supported by the Wilderness Coalition, the U.S. Geological Survey, The Nature Conservancy, the Center for the Reproduction of Endangered Species and the California Department of Parks and Recreation." The press release included a statement by Paul Spitler: "An area of prime concern down there is Coal Canyon, which connects the Chino Hills with the Santa Ana Mountains," Spitler said. "This is one of the prime mountain lion habitats in all of Southern California. A recent $40 million land purchase by the state should help keep that area intact." The Coal Canyon linkage was identified in the report PRIOR to the Davis purchase. Did California Governor Gray Davis spend $40 million for it at the behest of CWC and TNC thinking that USGS and California State Parks were lobbying for his action? At some point, the California Wilderness Coalition became aware of the investigation into their duplicity and began to change the original Letter. The letter was first removed from their web site and then replaced with a copy that did not contain the USGS seal nor the names of the USGS employees. It contains the same date along with seal for the California State Parks and the other attendees names and affiliations. With this action, the CWC and TNC have misappropriated official government seals to support their wilderness effort. The letter from the Department of Interior (USGS) details the duplicity of the situation. The original web pages displaying the agency logos has been captured by several different individuals. The State of California (Gov. Davis) is in receipt of the original falsified letter. Thank you for your letter dated January 25, 2002, bringing to my attention the matter of a letter to Governor Gray Davis signed by employees of the U.S. Geological Survey (USGS). There were two persons identified in the signatures as USGS employees, Lisa Lyren and Chis Haas. Upon investigation, we find that the employees did not consent to the use of their names in association with the USGS, nor was there authorization for use of the USGS logo. 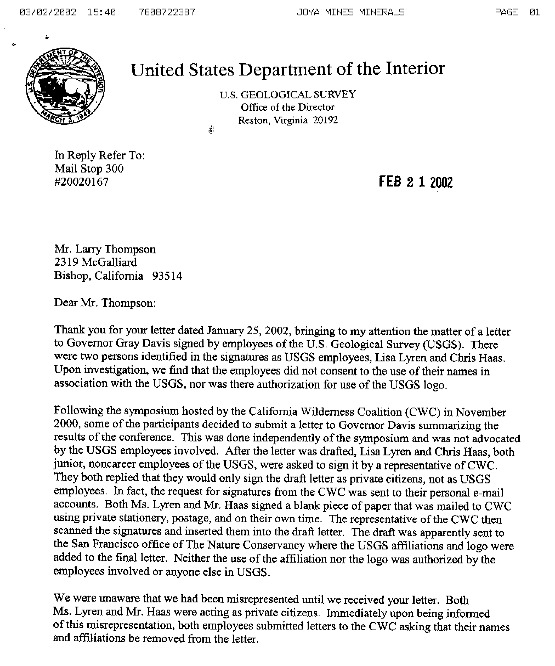 Following the symposium hosted by the California Wilderness Coalition (CWC) in November 2000, some of the participants decided to submit a letter to Governor Davis summarizing the results of the conference. This was done independently of the symposium and was not advocated by the USGS employees involved. After the letter was drafted, Lisa Lyren and Chris Haas, both junior, noncareer employees of the USGS, were asked to sign it by a representative of CWC. They both replied that they would only sign the draft letter as private citizens, not as USGS employees. In fact, the request for signatures from the CWC was sent to their personal e-mail accounts. Both Ms. Lyren and Mr. Haas signed a blank piece of paper that was mailed to CWC using private stationery, postage, and on their own time. The representative of the CWC then scanned the signatures and inserted them into the draft letter. The draft was apparently sent to the San Francisco office of The Nature Conservancy where the USGS affiliations and logo were added to the final letter. Neither the use of the affiliation nor the logo was authorized by the employees involved or anyone else in USGS. We were unaware that we had been misrepresented until we received your letter. Both Ms. Lyren and Mr. Haas were acting as private citizen. Immediately upon being informed of this misrepresentation, both employees submitted letters to the CWC asking that their names and affiliations be removed from the letter. We appreciate your bringing this matter to our attention. Our credibility as scientists is diminished if we are not known for providing objective, impartial, peer-reviewed science to our clients and the public at all times. If you need additional information please let me know.